We finished off the last week of March and the last week of Term 1 with some handwork. We visited our friends' farm to watch the sheep being shorn in late summer, and they were kind enough to give us a fleece for our handwork. 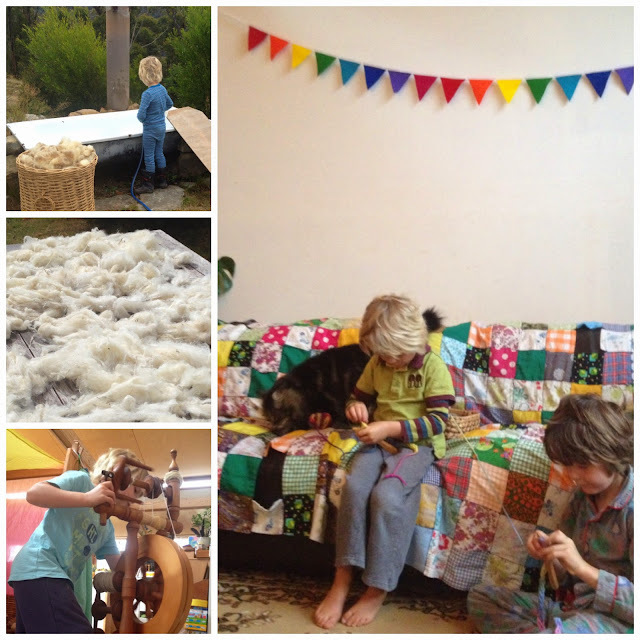 We collected the dirty fleece and spent a few days washing, cleaning, drying and combing the wool. We then attempted to restore the old family spinning wheel and had a bit of fun working out how to use it. We then moved on to Mr 4 learning how to lucet fork knit, and Mr 6 continuing with his lucet knitting project - making a skipping rope. Easter fell on the first weekend of April, so the rest of this week was spent in preparation for the Easter festival. 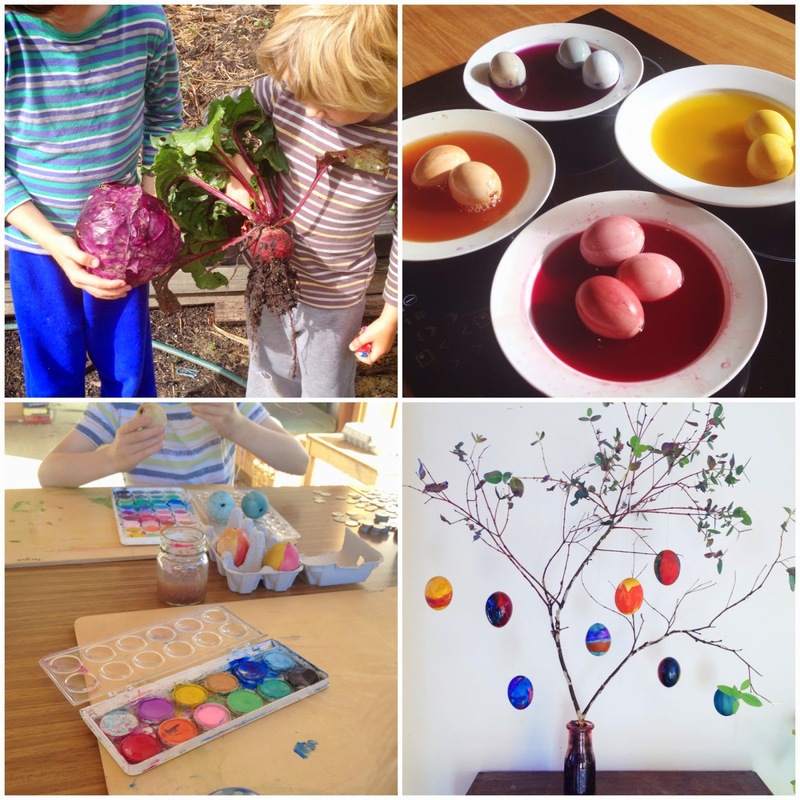 We harvested various vegetables and fruit from the garden, and also used gumleaves to naturally dye blown eggs. Once dry, the result wasn’t as bright as we’d hoped, so the boys added some watercolour paints to brighten our Easter Tree. 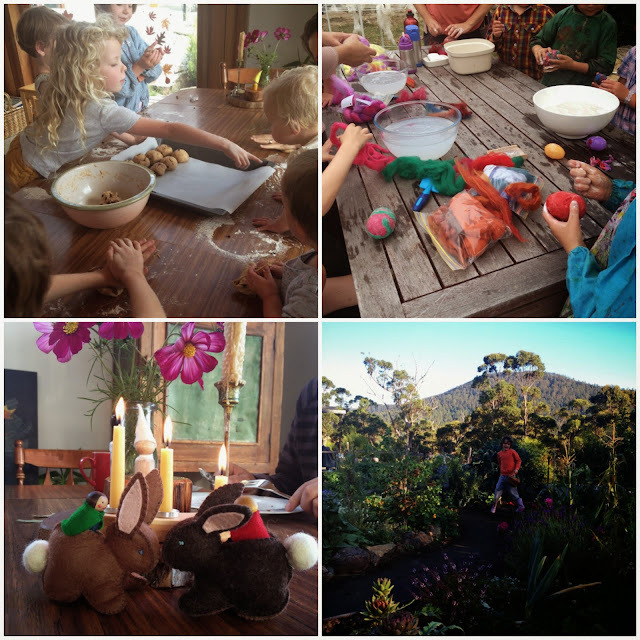 We met with our little homeschooling group during Easter week to bake hot cross buns and wet felt eggs, and to play of course. The rest of the Easter break we enjoyed spending time with family and friends, and spending special time as a family celebrating the Easter festival in our own way. We listened to Martin & Sylvia’s new SparkleStories audiobook series ‘Whole World Easter’, which gave perspectives on the experience of Easter in both the Northern and Southern Hemisphere, and explained in an age-appropriate way the Christian Easter story. Easter egg hunt in the Autumn garden! This week we continued to enjoy lots of time with Daddy who had taken an extra week after the Easter holidays to build Stage 2 of the house. The week was spent working together on the house, doing little wood working projects, extending the tree house cubby, playing with friends, and having 2 families stay over with us. On Friday, we attended the Tasmanian Symphony Orchestra ‘Mini-Maestro’ performance which was one of the highlights of the week! They were particularly enamoured with the double bass. 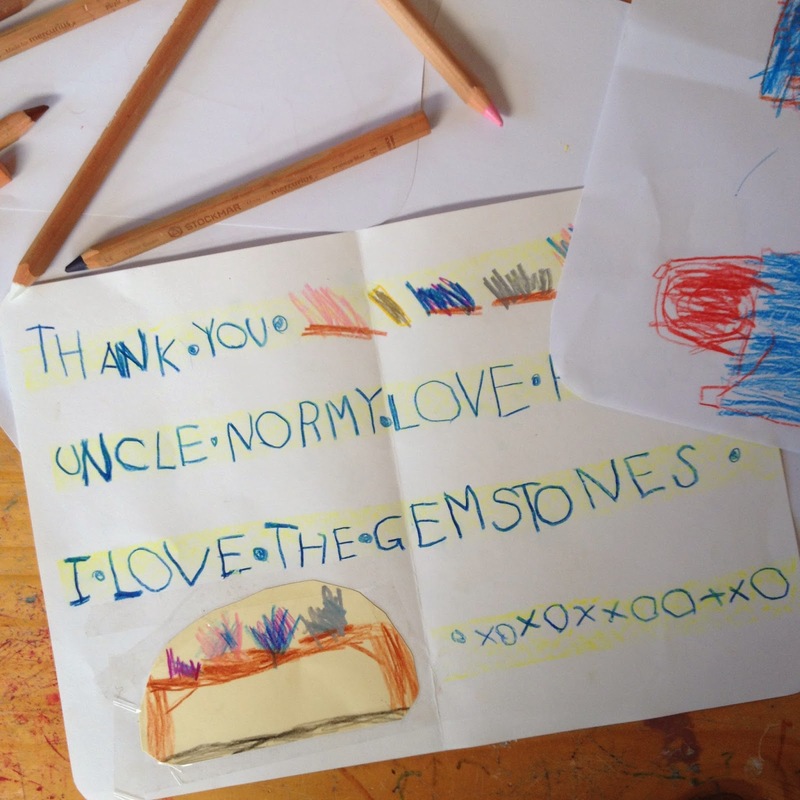 On Sunday, the final day of Daddy’s leave, we took a family trip down south to Lune River to go gemstone hunting. We dropped in to Lunaris, the gemstone fossicking shop and information centre, and found them to be very friendly and helpful. Armed with map (found <here> for all of those who have asked for more information), a good idea of where and what to look for and buckets of enthusiasm, we headed off into the Coal Hill Fossicking Area. 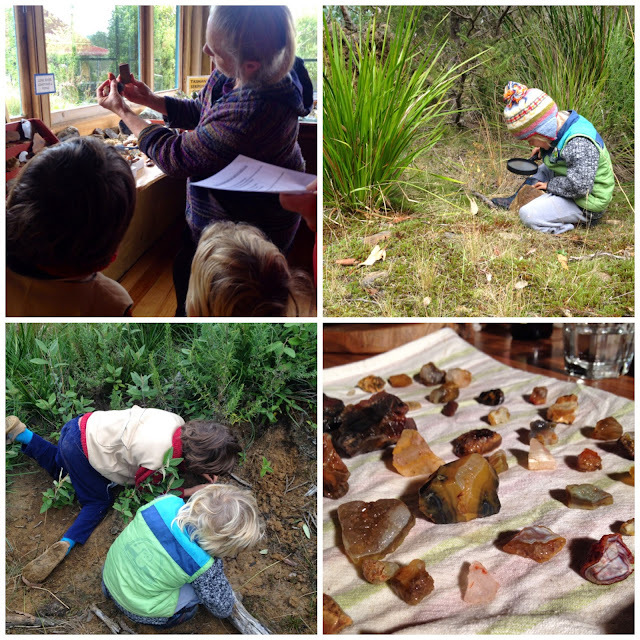 We spent a fabulous day walking around and digging up gemstones, and got quite a haul! Some really beautiful pieces of Lune River agate, fossilised wood, quartz crystals and some lovely little quartz geodes. Mr 6 was in his element! We will be working to a 2-3 day language block rhythm, using the other days of the week to explore natural sciences and maths, visit the library, go to gymnastics and yoga club, and join our friends for a homeschool co-op day. We will continue to use our Container Story from last month’s Form Drawing Block, to bring continuity to our letter learning phonics and writing journey. 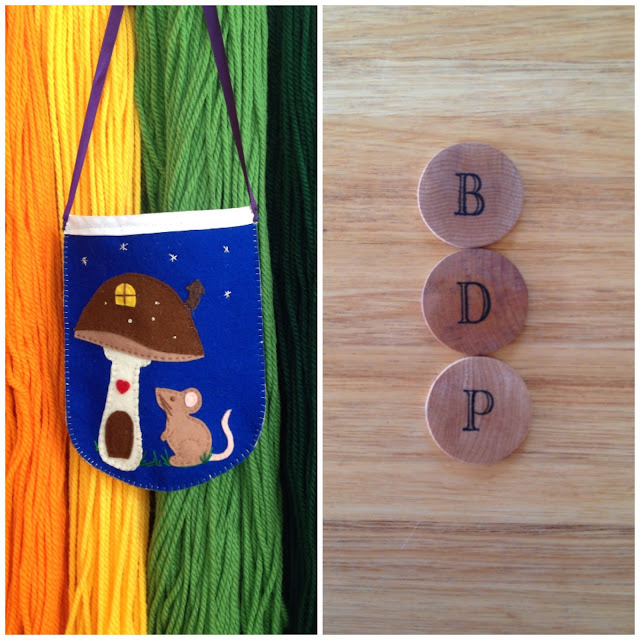 To accompany the Container Story, I hand stitched a little pouch for Mr 6 to collect “magic story tokens” in. The magic tokens are simple wooden letter discs which are given to him each week by the character who tells the weekly Main Lesson story. This has been a fabulous idea and worked really well. 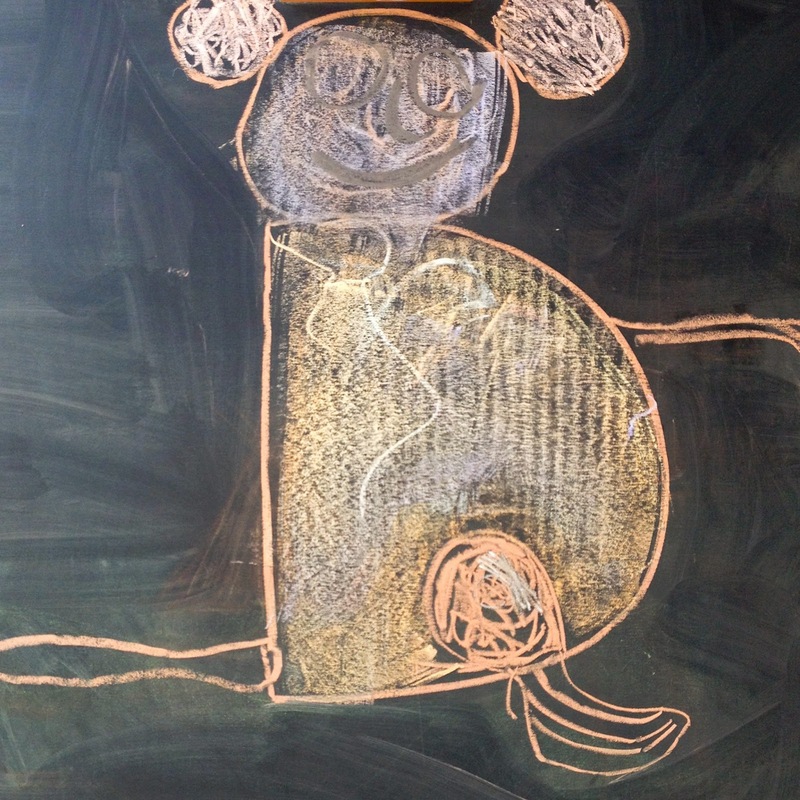 It is a lovely way of bring the letter to the story, to the blackboard drawing, and to the week’s learning. R: The “magic story tokens"
Both boys know the ‘alphabet song’ so I feel that introducing the letters in alphabetical order isn’t as important, and after much thought, reading, and questioning, I settled on introducing the alphabet using a combination of form and phonics. I found Barbara Dewey’s little booklet ‘Waldorf Reading for Homeschoolers’ a really useful resource for ideas on how to introduce letters by sound, develop our own picture alphabet, and for stories and tongue twisters for each letter. 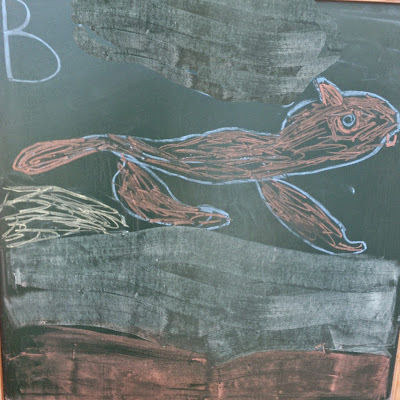 I also drew inspiration from a number of Waldorf blogs, Pinterest and the Earthschooling Grade One curriculum. I debated whether or not to introduce lowercase letters alongside the uppercase letters, but a bit of reading and research helped me decide to just introduce uppercase during this first language block. It is easier to master the writing and we are able to focus more on the sound qualities of each letter. Once Mr 6 has mastered the uppercase letters, we will move on to the lowercase which I imagine by then, will be able to be covered in quite a short time. Handwriting Without Tears also recommends introducing letters this way, although they introduce the alphabet letters in a different order. Having said all of that, the “magic tokens” Mr 6 receives each week have the uppercase letter on one side and the lowercase letter on the reverse side, so he is exposed to both regularly. However, as he begins to write, we will just focus on perfecting the uppercase alphabet first before moving on to the lowercase, then to the cursive alphabet next year. I like the Waldorf idea of immersion in a focussed block of learning, and whilst we are going to use this as our main focus of the week, I am also going to try to bring in other areas and disciplines of learning within a theme for the week. The theme will revolve around the letter of the week, as well as elements drawn from the main lesson story. I feel this way our learning will cover broad areas and have a solid overarching theme and an interconnectedness. 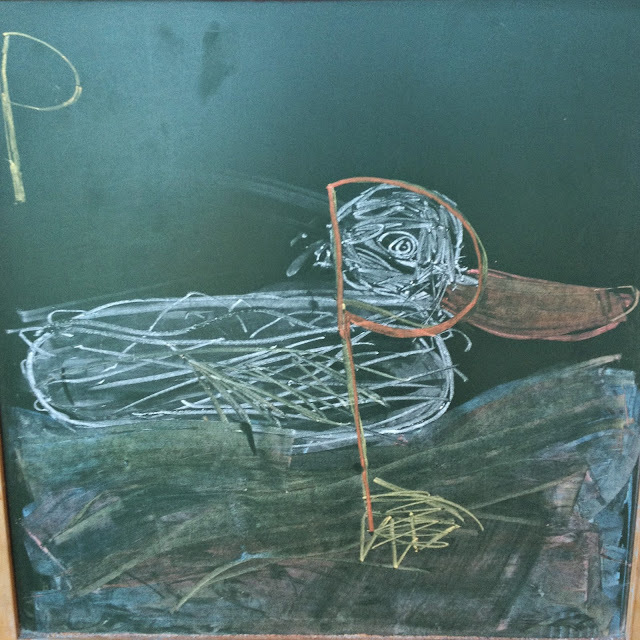 On the first day, I draw a blackboard scene or character from our weekly language block story. I have chosen to do this in the morning while they are present, as I think it is helpful to have them see the drawing techniques employed and the development of the image. At this stage they do not know which letter we will focus on this week. 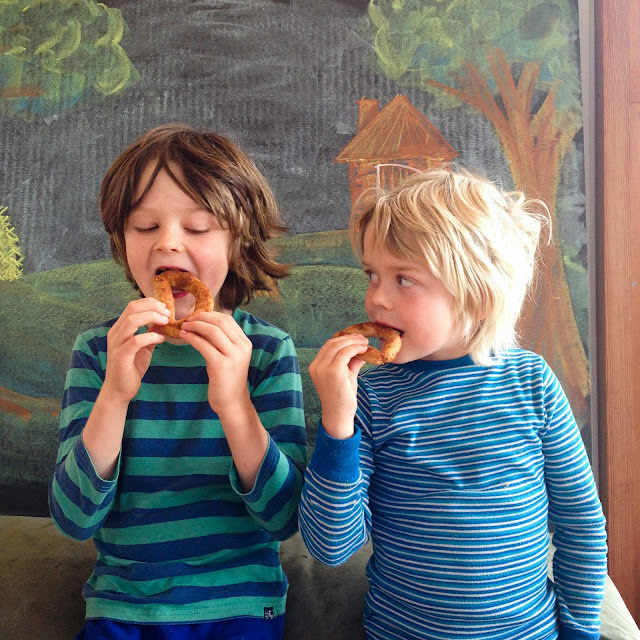 I love Waldorf education’s multi-sensory approach to learning, and the language block is no different. We spend some time exploring the sound of the letter, and bring in some multi-sensory learning techniques, or sixth-sense language as it is described in the Earthschooling curriculum. We move, touch, feel, and manipulate objects as we learn our letters. We might do some gardening with the letter of the week, or some baking which is a lovely way to “smell” and “taste” the letter. We find the letter in our nature walk, or see how many words we can think of that begin with the letter. We also make up silly songs and tongue twisters beginning with letter of the week. 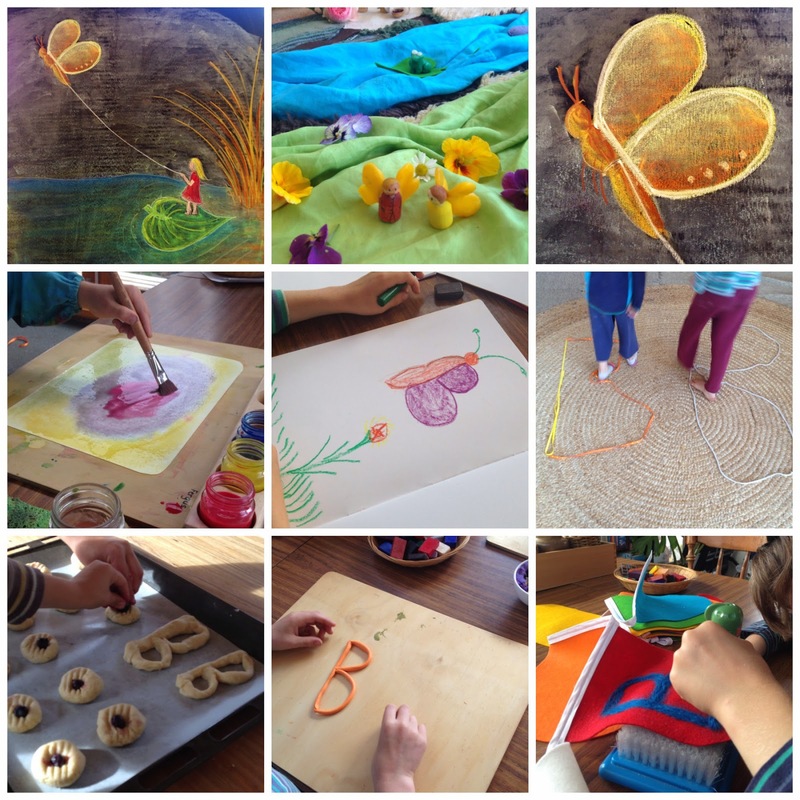 In the afternoon, we will usually do some handwork, painting, free-drawing or modelling based on elements of the story. 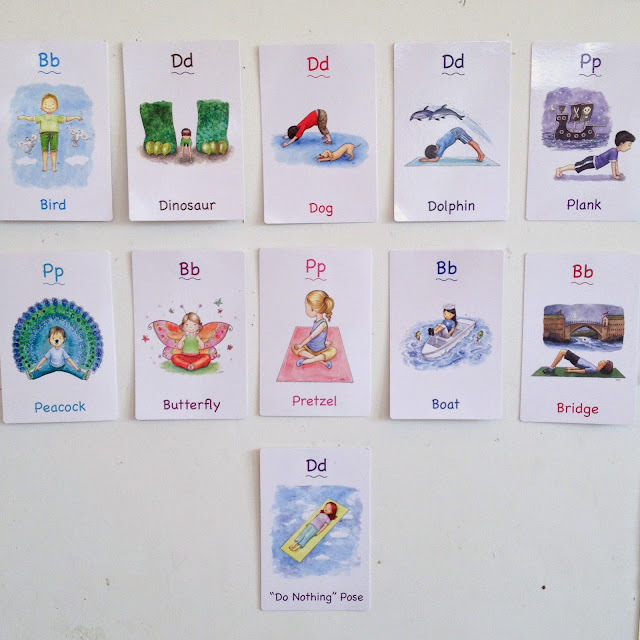 At bedtime, we use our 'ABC of Yoga for Kids’ cards to practise the letter of the week poses. The following day/s, we continue with multi-sensory learning and start our morning lesson with an active circle time. 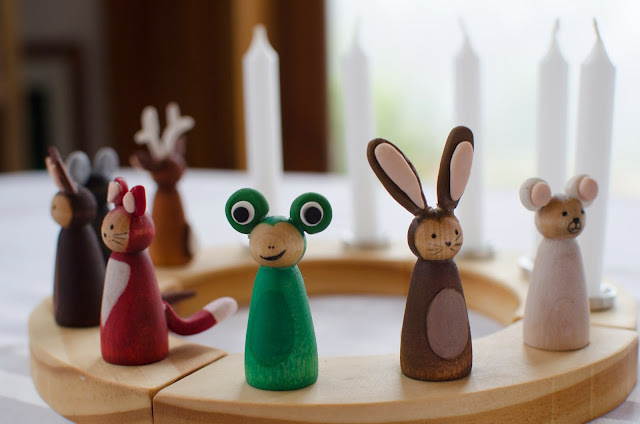 We use a few verses and songs from our lovely seasonal Autumn Circle Time collection, and then move on to tongue twisters, letter rhymes and ABC Yoga letter poses. We have been pracising skipping each morning, jumping along in time to our letter rhymes and making up ball rolling/catching and bean bag games to accompany them. I’ve found the boys really respond well to learning with movement, plus it’s fun! At this point, we bring the lesson drawing to the left-hand page of our Main Lesson Books. With a combination of block and stick crayons, I draw the picture-alphabet character from the story alongside the boys, so they can see the techniques I am using to draw and blending the colours while they draw a similar image. This is really fun and often leads to interesting discussions on art techniques. Finally on the right-hand page, we bring the letter itself to paper. We use a large triangular pencil for this as Mr 6’s pencil grip is good and being left-handed, using pencils means he doesn’t smudge his writing. We have a separate Main Lesson Book for letter practise, which Mr 6 often brings out just for fun. The rest of the week is spent finishing off the Language Block activities, and then moving into some natural science learning. I’ve tried to tie this in with our story theme or our letter to add some cohesiveness to our week. We also use the rest of the week to socialise, attend homeschool groups, visit the library, go on excursions, and go to yoga club or gymnastics. This week our Language Block adventure began and our little Container Story family continued on their way through the forest meeting a 'beautiful butterfly balancing on a bud'. This magical butterfly told the children the story of ‘Thumbelina and The Butterfly’, and introduced the letter of the week, the Letter B which we found in the butterfly’s wings. 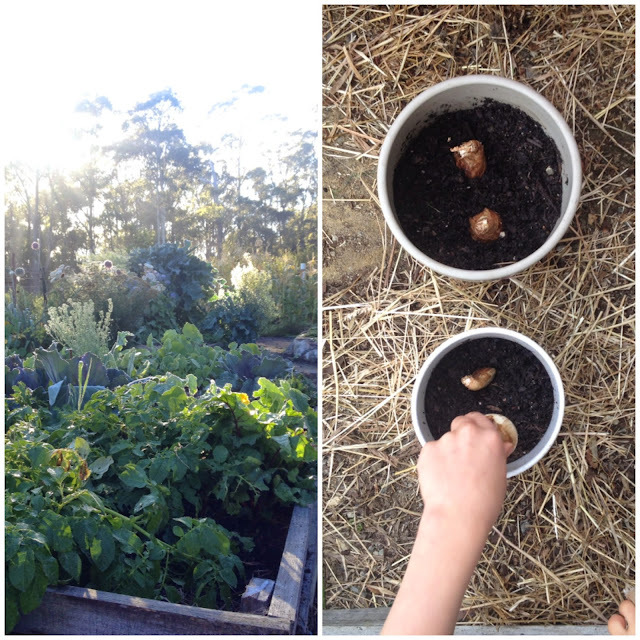 Another multi-sensory learning project we will do each week is to garden with the Letter of the Week in mind. 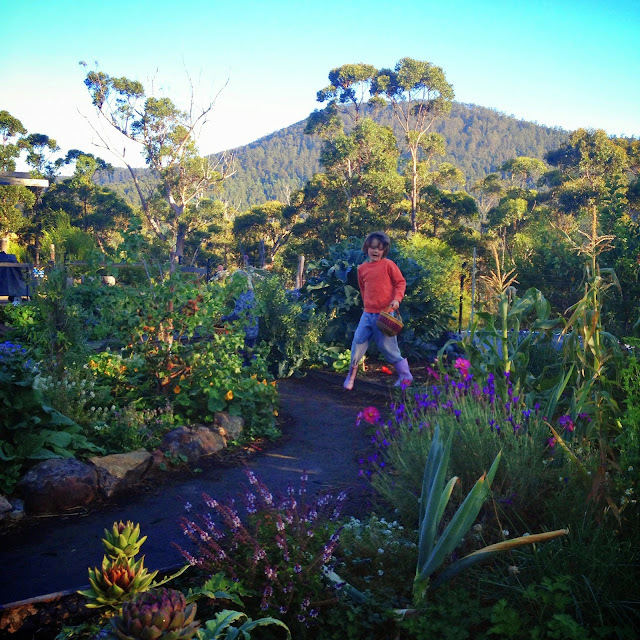 We are avid followers of Permaculture, having set up a number of systems over the years. I love that the boys are curious about the garden and love to help with planting, harvesting and are full of ideas on how to implement Permaculture principles. 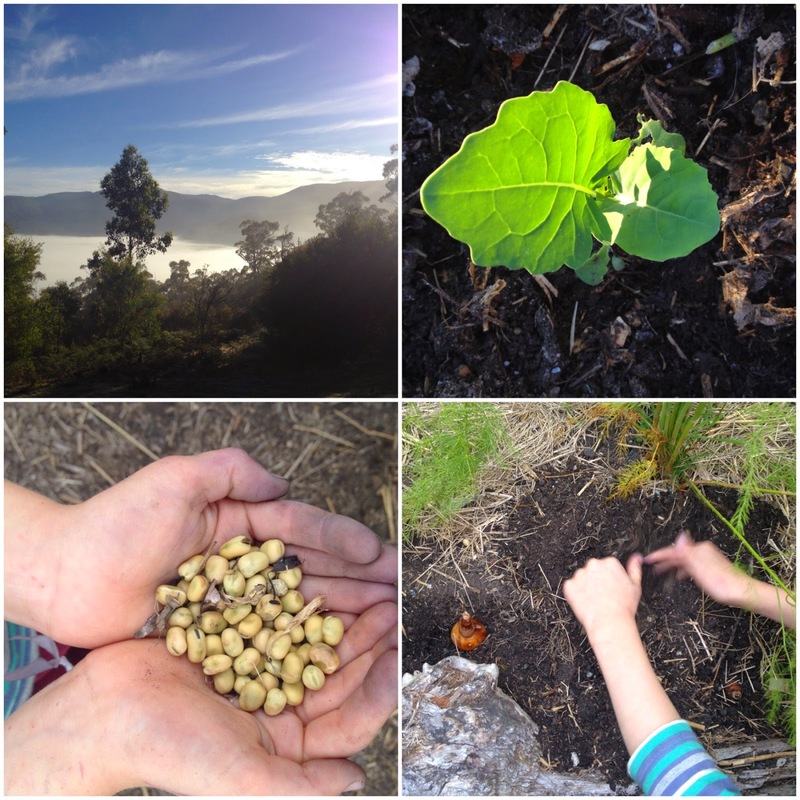 I am really excited about bringing a strong Permaculture influence to our homeschooling learning. 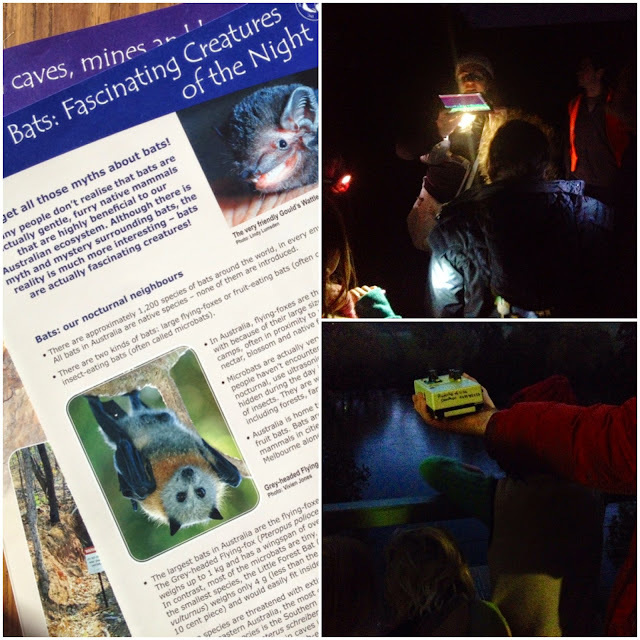 We finished off the week with the Huon Valley Roamer’s Landcare Bat Night. It was a fun, educational evening learning about the local bats and even spotting three of the species in our area. I think being able to use the ultrasonic ‘bat detectors’ was one of the highlights for the children! 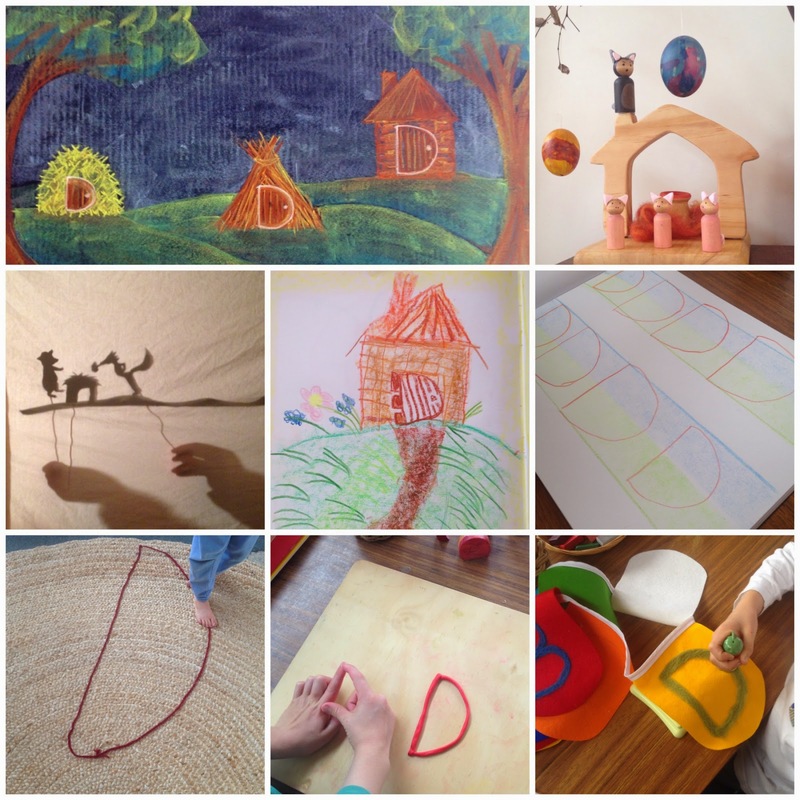 This week we introduced the Letter D with the classic fairytale of ‘The Three Little Pigs’. We found the Letter D in the doors of the Little Pig’s houses. I'll still be four years old tonight. Tomorrow, I'll be five years old. Five kisses when I wake! 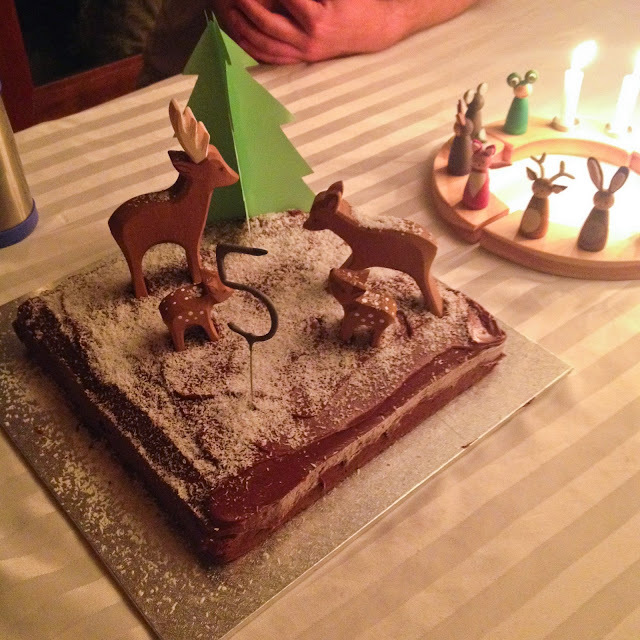 Five candles on my cake! This week I adapted a story from Susan Perrow’s wonderful book ‘Healing Stories for Challenging Behaviour’. We used the story on p. 249 ‘Baby Bear Koala’ a therapeutic story for separation anxiety. I changed the baby koala to a baby possum, called Blossom Possum. Both boys just loved the story! 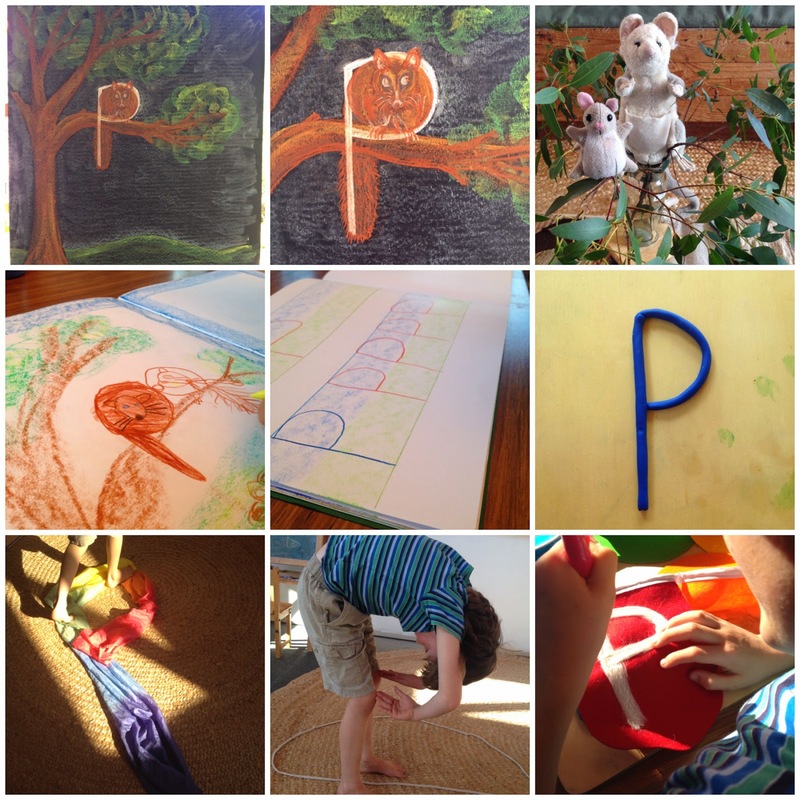 I think using their own special teddies helped also :) Blossom Possum herself became the Letter P in our chalkboard drawing. 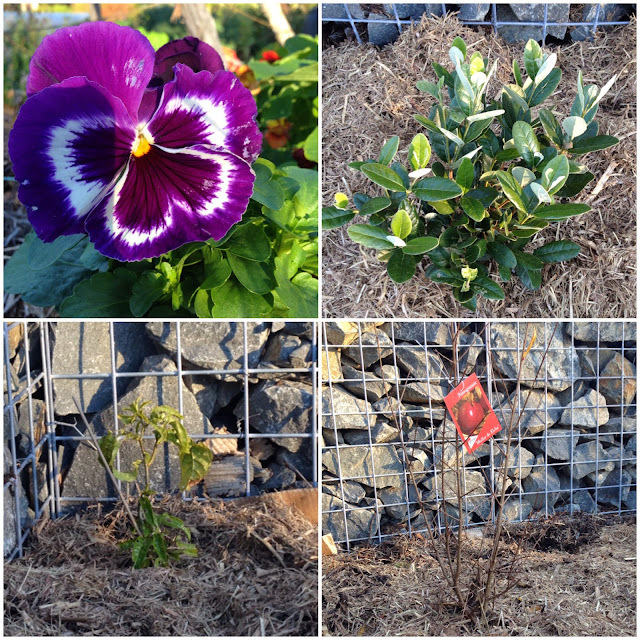 BL: Planted out our Passionfruit, poor thing! I was just wondering where you got your crayon holder from? If you made it? It's lovely! I'm in the UK :( I can imagine shipping would be a fair bit for such a beautiful piece! I've not seen anything like it before! 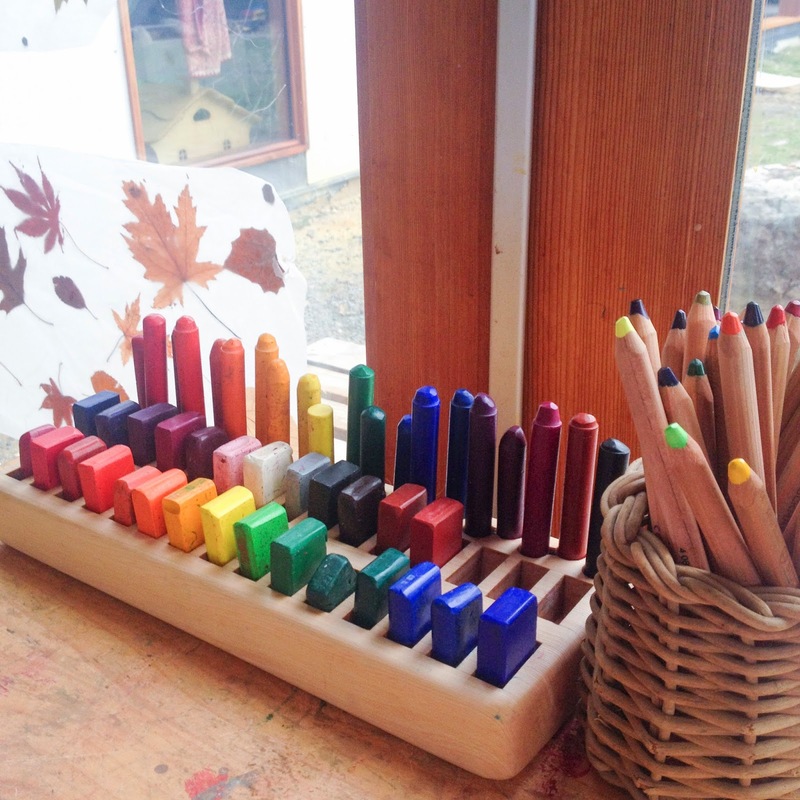 My son's crayons are in a crayon roll which is beautiful, but I think it would be great to have them in a stand where they may get more use being out and seen! where didi you get the crayons wood box ? its is amazing, I would like to have one. Hi there :) A friend actually made this crayon holder for us. If you are in Australia, I have a contact who makes them here and could pass on her details to you. Hope that helps. Hi Heidi, I'd love to talk with your friend about the crayon holder. Can you pass the details or contact info to me? Thanks! 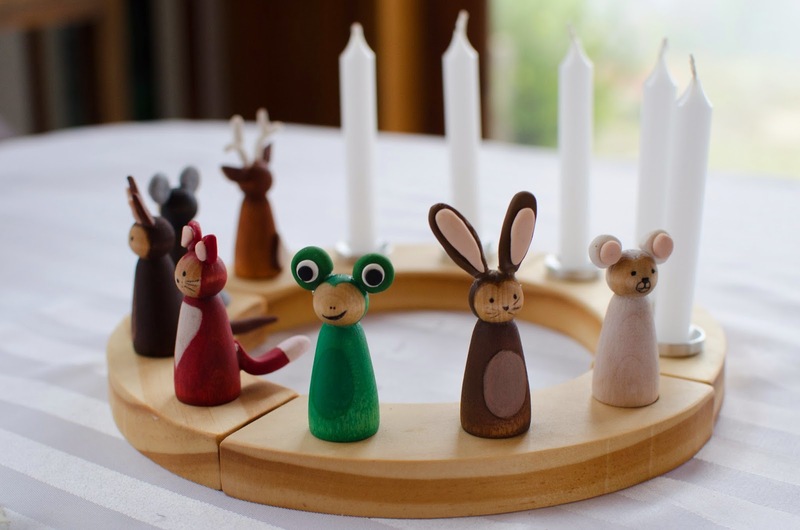 I can't seem to add active links in comments, but anyone in the US interested in a similar product can find them in Jennifer's gorgeous Esty store 'From Jennifer'. Are you in the US, Lara? Hmm links don't seem to work in comments. If you search for her Easy story 'From Jennifer' you'll find them there.